Posted on April 7, 2017 by Matthew Leib. This entry was posted in Faculty Friday, Spotlight and tagged Faculty Friday, population health. Bookmark the permalink. 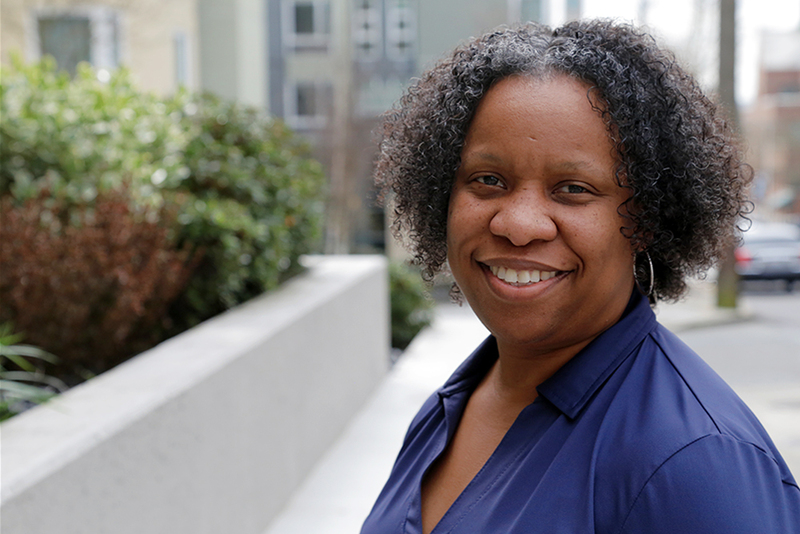 Upon earning her Ph.D. in Developmental Psychology from Columbia University, what Wadiya Udell wanted most was to give back to first-generation students in a small liberal arts college atmosphere like the one she had experienced as an undergraduate at Wheaton College in Norton, Massachusetts. She had her eye on just the place. Perched high atop a bluff with a forest backdrop, located beside a small city, with a diverse population of students and interdisciplinary academic culture, it hardly mattered UW Bothell lay more than 3000 miles west of New England’s low and rolling hills. Eleven years later, Udell is an associate professor of Community Psychology and a recently appointed member of the executive council for the University of Washington’s Population Health Initiative. She studies factors contributing to adolescent health—specifically that of youths in the juvenile justice system. It’s a group whose experiences are often marked by untreated mental health problems, substance abuse, and trauma histories. They might also lack a safe home environment—living on the street, couch surfing, or with parents they may not be able to rely upon. Udell says that, put together, these external factors contribute for increased risk behaviors and negative health impacts, especially in the realm of sexual and reproductive health, such as HIV, STIs, and unwanted pregnancies. “They’re engaging in these high-risk behaviors and not getting checked or treated,” Udell says, adding that lack of access to healthcare is another factor that can exacerbate an already tenuous, turbulent teenage existence. Care is often received at the detention facility itself, as opposed to out in the community when youth are not detained. In recent years, Udell’s work has been most concerned with how to increase access to care for justice-involved youth, especially in the three areas for which youth can access treatment without parental consent: drug use, mental health, and sexual health. According to a 2015 Tacoma News Tribune report, Washington detains youth for noncriminal offences, such as skipping school or running away, more often than any other state. In 2011, the last year for which federal data is available, Washington detained 2,705 juveniles—more than twice as many as Kentucky, which detained the next most at 1,048. In 2012, King County voters approved a $210 million levy to replace the existing courthouse and detention center at 12th Avenue East and East Alder Street with a new complex, formally known as the Children and Family Justice Center. But the initiative has since met with protests from opposition groups demanding more emphasis be placed on alternative resources for rehabilitation. But even the decision to pass behind the center’s walls to work with the youth requires great thought, Udell says, as it places volunteers along the deep divisions in the debate over whether or not minors should be held behind bars. Even so, Udell describes herself as “a little bit of a cynic.” She says she has few illusions about the impact of the short monthly group sessions, adding she doesn’t believe the short time she spends with detained youth discussing risks, consequences, and emotion regulation is necessarily saving anybody’s life. Udell sees the greatest impact happening back at UW Bothell, where, among other courses, she teaches “Risk and Resilience” and “Realities and Representations of Adolescent Development.” This quarter, she is curating a weekly Research in Progress seminar series aligned with the UW Population Health Initiative featuring investigators from varying disciplines across UW Bothell campus from Nursing and Health Studies to STEM and Education. Investigators will be discussing how their research seeks to improve the health and wellbeing of populations from the community level to the world at large. The next phase of her own research will be to look at ways of creating structural mechanisms to be able help youth access medical care on their own. She is in the process of researching and testing multiple models that not only seek to increase collaboration between health service providers, but also a digital tool to help youth to access and exert more ownership over their own personal data and health information. Udell says that while developing and testing such a tool might be innovative, a basic question remains. Her formative years in Bed-Stuy coincided with the nationwide crack epidemic that devastated urban populations. She first considered education, working at what she describes as an “alternative middle school” for students who had been kicked out of the public school system. Through that experience, it became evident to her how deeply these children’s problems often ran. The more Udell studied how effective health outcomes are engineered, the less she found herself wanting to part of a traditional psychology department. It’s why she set her sights so firmly on UW Bothell’s School of Interdisciplinary Arts & Sciences after receiving her doctorate. As faculty there, “surrounded by a ton of people with different perspectives on a variety issues,” Udell says she has the space to make meaningful collaborative connections, which result in a stronger overall approach, which itself in turn portends a greater likelihood of making progress on questions about population health. Wadiya Udell holds a B.A. in Psychology from Wheaton College (Norton, MA) and a Ph.D. in Developmental Psychology from Columbia University. See the full schedule for the Research in Progress seminar here.